“To find beauty in the most grotesque things is a gift,” says photographer Seph Lawless, whose interest in forgotten places and people have led him (and his camera) to abandoned shopping malls, shuttered amusement parks, and post-Katrina New Orleans. For his latest project, a new photo book and e-book titled Hauntingly Beautiful, Lawless trains his lens on a host of abandoned homes, which are as stunning to look at as they are eerie to witness. See more of Lawless’ work on his Website, or by following him on Facebook, Twitter, Instagram, or Tumblr. This house in Brush Park, Michigan may not look familiar now—but wait until next year. "It's being used as Batman's mansion for the upcoming movie Batman vs. Superman: Dawn of Justice," says Lawless, who was "hired as a location scout for the production after the assistant director saw my image of that house in the news." 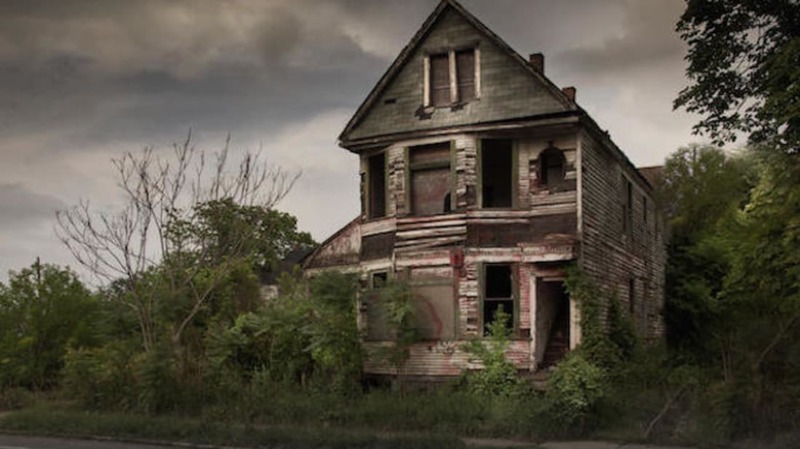 An up-close look at Detroit's blight. In 2013, Cleveland police arrested 35-year-old Michael Madison, a suspect in at least three murders. Believing that he hid the bodies of his victims in nearby abandoned homes, they searched several—including this one, in East Cleveland. "The legend is that this home is haunted by a father and son that died during a hunting accident," explains Lawless of this house in Nova, Ohio. "The boy shot the father by accident then the boy committed suicide." Beware of witch! According to Lawless, many believe that this house in Milan, Ohio is haunted, "based on several people believing a witch was buried on the property that may have even predated the home itself. The house was eerily abandoned with an equally abandoned barn, but was partially in use when I noticed a huge bison the size of a truck stump out of the barn into the grazing yard—oddly out of place and almost as if it was guarding something." A forgotten home in Geneva, Ohio. Located in a rural town near the border of Mississippi and Louisiana, this "beautiful former plantation home had several rooms that appeared to be rooms where slaves were housed," says Lawless. "Some walls were even marked with sharp objects similar to some abandoned prisons I've shot. That home was pretty emotionally draining to photograph." Texarkana, Arkansas is the site of one of the country's most infamous unsolved serial killers, known as The Phantom Killer or The Moonlight Murders. "That abandoned house is near the first road which was used as a murder site," says Lawless. What was once a home in Philadelphia. The interior and exterior of an abandoned house in Pittsburgh. The day after shooting in McKeesport, Pennsylvania, this house—which appears on the cover of Hauntingly Beautiful)—collapsed. "These are the last images ever taken and my feet fell through the floors several times photographing it," says Lawless. "It felt as though it would collapse at any moment and I was shocked to see it had collapsed just hours after I was inside it. Truly frightening and still gives me chills thinking about it."